This entry was posted in Blog, General, Homeowners Insurance on 06/28/2017 by Alejandra Vazquez. If you recently bought your own ‘fixer-upper’ or have a few projects in mind for your current home, you might be worried about the cost of professional renovations. Homeowners need to remember that safety should be the first priority when it comes to home upgrades. This might involve understanding the scope of certain projects as well as researching homeowners insurance quotes online so you’re covered for unexpected damages. Here are four home projects that budget-minded folks with a DIY spirit can tackle on their own. There are some quick outdoor projects that your family can tackle in a weekend that can make the exterior of your home look great. Laying down mulch over bald or dying grass can be an instant upgrade. Incorporating rock gardens and plants that are native to your area will help keep ongoing maintenance needs to a minimum. Keep in mind how much you see yourself gardening in the future so that this can guide your decisions on upgrades involving plants, flowers, and grasses. 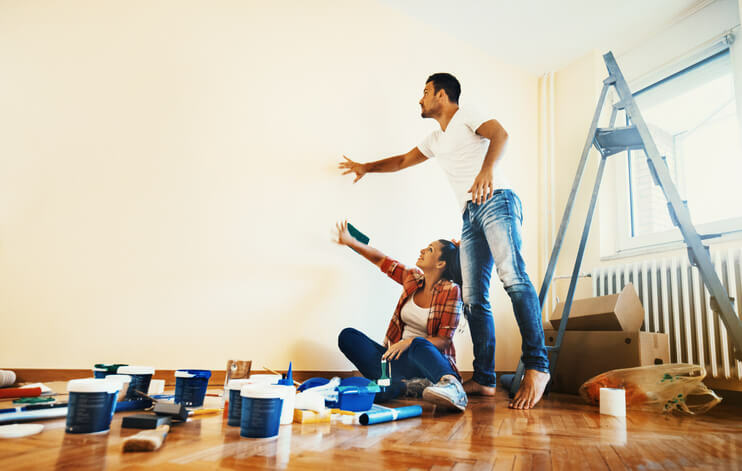 If you don’t have the time to paint the entire interior of your home, you can still do some minor painting tricks that can make your home look new with minimal effort. By focusing on accent walls here and there in the living room, kitchen, or hallway, you can add a splash of color. You don’t necessarily need to paint every wall in your home to have a dramatic outcome. If you have exposed sheetrock or unfinished accents where walls meet the ceiling and floor, these are easy DIY projects. Texturing walls before painting and adding crown moulding and baseboards as finishing touches can be simple fixes with a big pay-off. If you would like to unify the look of your entire home, updating all of your drawer and cabinet pulls will modernize your home. Bathrooms and kitchens can match built-ins and larger furnishings with simple knob updates. If you can bring along various existing knobs and pulls to your local home improvement store, you can make sure you swap these out with the right sizes. This way, you can keep your project going when you get home without any major stalls. If your lighting fixtures overhead are outdated, these can be swapped out easily with new fixtures. This includes your light bulb options as well. If you can source new LED options, you can cut down on energy costs and extend the life of your lighting. These bulbs come in warmer looks than they used to, so they’re worth a try. If you are hoping to add in a new lighting scheme overall or are looking into recessed lighting options, it is a good idea to bring in an electrician or specialist to help. All DIY work aside, for more challenging projects or home renovations outside of your scope, be sure to call in a professional contractor to give advice and head up major work. Some renovations can actually save you money when it comes to insurance costs. You and your family’s safety should be the first thing to take into account, and looking into homeowners insurance quotes online might be your first step. As a homeowner, it can be liberating to take on home projects. The average cost of homeowners insurance is worth the coverage this will provide over time. To learn more about our different types of homeowners insurance, request a free homeowners insurance quote online or call (888) 443-4662 to speak to an insurance expert. We’re available to answer your questions about insurance and help you find a policy that fits your budget.